Decatur Lakeview High School "Spartans"
Decatur (population 81,860) is Illinois' eleventh largest city. The city is named after Stephen Decatur, naval war hero of the War of 1812. It is located in central Illinois about 30 miles east of Springfield. It is the county seat of Macon County and is located in the center of the county. Decatur is nicknamed "The Pride of the Prairie" and has its own airport. Milikin University and Richland Community College claim Decatur as their home. According to www.mapquest.com the following roadways lead to and from Decatur; Interstate Highway 72, U.S. Routes 51 and 36, Illinois Routes 48, 105, and 121. The following waterways flow into Decatur; the Sangamon River, Finley Creek, Big Creek, Long Creek, Stevens Creek, Spring Creek, and Sand Creek. The following railroads also own tracks that are laid through the town of Decatur; Illinois Central Gulf, Norfolk & Western, Baltimore & Ohio, I.t., and I.c.. The city also has a nice lake in Lake Decatur. Decatur was founded in the early to mid 1800s. It is believed the school system was started at the same time. 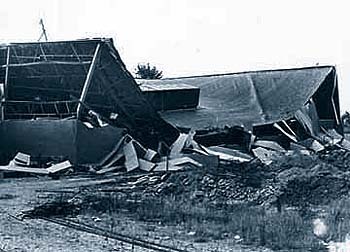 Some history information was provided to us by Buena (Hall) Kaylor (Class of 1968)"
Lakeview was not closed due to falling numbers in the area. The Decatur school district appointed a committee to decide which school was to be closed. The committee met for over a year and recommended that Eisenhower School be closed. (No room to expand, the football field could not be used for games due to it's location (next to St. Mary's Hospital). Football games were held at John's Hill.) 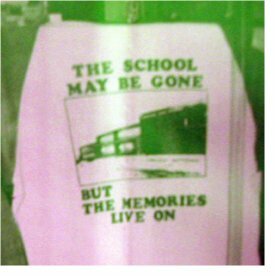 And remember, Lakeview had just been rebuilt due to the explosion! Lakeview was closed because ADM wanted to purchase it for an office building...pure and simple." 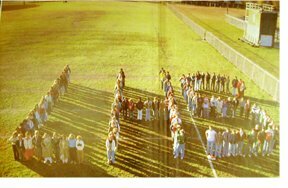 One interesting story relayed to us by alumnus Ron Lanham was regarding the 1974-75 school year. A tanker car exploded (See photo to your right) and leveled the new school addition to the Lakeview High School building. The Lakeview building was rendered unusable until it was repaired. The Lakeview kids attended classes in Stephen Decatur High School in the afternoon while the Stephen Decatur kids attended in the morning. The football team at Lakeview had their lockerroom at the Decatur Armory building with practices held in the morning. 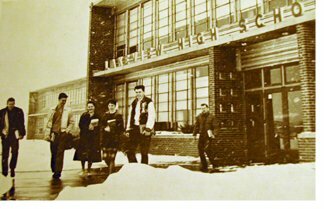 The former Lakeview High School building was bought by a private company called Archer Daniels Midland Co. A nice article regarding the use of Lakeview HS can be read at http://www.herald-review.com/articles/2005/08/13/news/local_news/1009475.txt. LHS Class of 1974 alum Joe Caputo tells us that Lakeview High School utilized two different fight songs during its existence. Joe provided us with the words and years that each song was used. Thank you Joe! 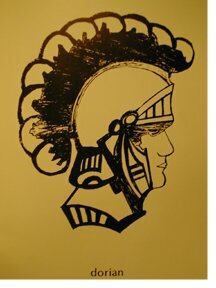 The Lakeview High School Spartans had many successful seasons in both boys and girls and sports. The boys competed in football, basketball, track, golf, baseball, wrestling, and possibly more. The girls competed in basketball, track, volleyball, softball as well as other sports. "Lakeview was part of the Cenois Conference before joining the Apollo Conference. The Cenois Conference was made up of Lakeview, Mt. Zion, Warrensburg-Latham and Argenta- Oreana." Great teams, coaches, and players are all items we would like to learn about and share regarding Lakeview High School. The Spartan football program is covered extensively on the IHSA website (www.ihsa.org). None of the Spartan teams qualified for the State Football Playoffs, however many good seasons were enjoyed. 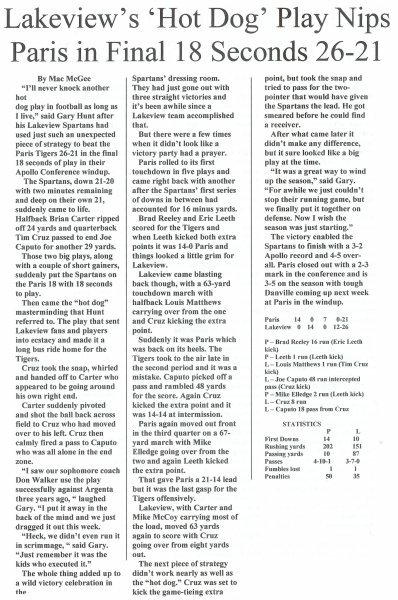 Harold Perry, Ron Wisher, and Gary Hunt all spent significant time coaching the football program at Lakeview High. 1960-61 3 - 6 Coach Frank Chizevsky Jr.
1961-62 3 - 6 Coach Frank Chizevsky Jr. Boys golf brought Lakeview High its highest team finish in state competition. The teams of 1973 and 1975 both had top ten finishes at the IHSA State Match. One golfer, Ray Goodman, even finished 2nd overall in the state for the Fall of 1974! Team standings in State Competition are listed below. 1972-73 Team Finished SEVENTH at STATE MATCH Competition!! 9.) MacArther, Prospect, Griffin, Normal U-High, all tied with 642. 1974-75(Fall) Team Finished SIXTH in STATE MATCH Competition!! One male trackster earned a medal at the IHSA State Track Meet. *Coach Fred McKenzie served as head coach of the Lakeview thinclads from the mid 1970s until the school closedin 1982. The boys basketball program had some real nice seasons during their existence. They were also said to have shot very well from the free-throw line in the 1950s. Many season records and most of the coaches names are absent. Coach Jack Fabri had a stop here during some point of Lakeview's existance; he had a career record of 387-113. The best records from Lakeview are listed below. An example of their free-throw prowess: Lakeview players made 540 of 936 from the "charity stripe" during the 1952-53 school year. On December 30, 1954 in a game against Mt. Zion, Lakeview players made 47 of 60 shots, which is the fourth best shot total in state history! *One of the great basketball players said to have donned the school colors of Lakeview High was Wayne Dunning who would go on to star at Milikin University. *Dave Marquis set the single season scoring record for the city of Decatur a season average of 26.2 in the 1971-72 season for Lakeview High School . This record may still stand to this day. Dave scored 653 points that year which at that time was a single season record. The Lady Spartans had some great seasons as well. The team of 1979-80 in fact made a Sweet 16 appearance in the State basketball tournament. Coach Brenda Clark led the team from 1974 through the 1982 season. The best seasons are listed below.